Austrian Violinist Erica Morini, the Teacher's Violinist? November 12, 2018, 11:15 AM · With Halloween a recent memory, it is perhaps timely to recall a musician who, shortly after her death in 1995, was described as "the most bewitching woman violinist of this century." I refer here, of course, to that eminent violinist of the Golden Age, Erica Morini. 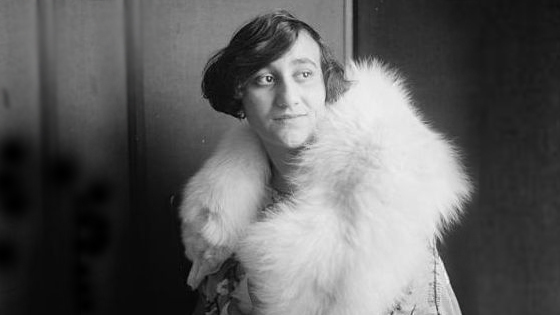 Austrian Violinist Erica Morini in the 1920s. Photo courtesy of the George Grantham Bain collection at the Library of Congress. As a brief recap of her career, Erika Morini was born in Vienna in 1904 to a musical family. She was taught initially by her father, but later studied with Otakar Ševcík. She made her orchestral debut with the Berlin Philharmonic and Leipzig Gewandhaus orchestras in 1916, already celebrated as a "wunderkind." Her American debut on January 26th, 1921, was reportedly one of the sensations of that season’s New York musical calendar. In 1938, presumably reflecting the ominous tide of events in Europe, Morini, who was Jewish, had changed the spelling of her name from Erika to Erica. She immigrated to New York at the start of World War II and eventually retired from concertizing in 1976. Apart from such dispassionate biographical details and critiques of her playing, mention has been made of Morini’s particular sound, an elusive attribute which has left a personal mark. My violin teacher in 1950s South Africa was Dr. Bronislav Fryling. A native of Poland, he was an unusual and versatile character – violinist, business man, and racing car driver. For his daily driving, he acquired one of the first of the iconic Jaguar 2.4 saloon cars to be imported to South Africa. Since automobiles happened to be another of my passions, we spent many hours tooling around Johannesburg in this car in lieu of studying Flesch and Kreutzer. Fryling had been a professor of violin at the Music Institute in Krakow but was forced to leave Poland in the late 1930’s after defending Polish Jews against growing political threats. He eventually settled in South Africa after spending part of World War II in Kenya. His musical exploits in East Africa during the war make for an extraordinary story, but that is a tale for another time. To make a point during lessons, Fryling would occasionally draw on his personal association with Erica Morini in Europe in his pre-refugee days. Fast forward 60 years. My granddaughter is studying the violin in Denver, Colorado, using the same atavistic collection of instruments that had been handed down to me by my forebears. My granddaughter’s teacher waxes lyrical about the characteristic Morini sound, apparently sufficiently well-captured on recordings which left an indelible impression on her as a child listening to her father’s records. So, a glimmer of Erica Morini’s influence on violin tutelage lives on into the 21st century. It is perhaps telling that two violin teachers, on two different continents, and two generations apart, would single out aspects of her playing as an aspirational touchstone of violin artistry. As a tidbit to fill in the generational time lapse, in 1963 I had been granted a scholarship to study for a PhD at Yale University. By virtue of this stroke of good fortune, I was handed an opportunity to attend an Erica Morini concert at Yale’s Woolsey Concert Hall on February 11th, 1964 and to meet her backstage after the performance. Here I was able to triangulate a link with the late Bronislav Fryling. As shown in the accompanying autographed concert program, Morini performed Mozart’s A major concerto with the New Haven Symphony. The performance was made all the more memorable by virtue of the personal violinistic points conveyed from Morini’s playing through those instructional moments in faraway South Africa. On this occasion, Morini likely used her cherished 1727 "Davidoff" Stradivari, which had been purchased for her by her father some 40 years previous. In October 1995, the violin was reported missing from Morini’s apartment while she was in hospital, aged 91. She died two weeks later, apparently unaware of the theft of her treasured instrument. The violin has not been recovered as of the time of writing, and this case remains one of the FBI’s top unsolved art heists. 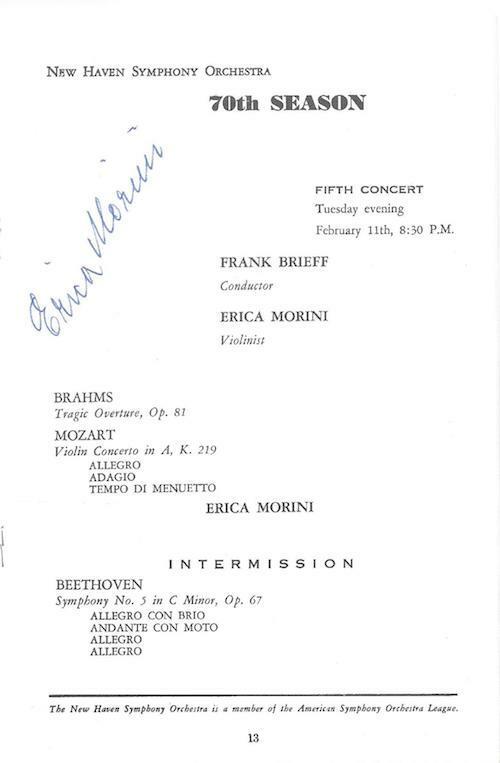 Autographed program of Erica Morini concert with the New Haven Symphony, February 11th, 1964.